Be at the Heart a of Toronto - located across the street from The Air Canada Centre & Toronto's Central Transit Station(TTC, GO Train&Buses, Via Rail, UpTrain) . The Maple Leaf Building provides exceptional convenience as there is a TD Bank, LCBO, Longo's Supermarket, The Real Sports Bar & a Sports Check located on the Main Level - & thats not all - Being on Bremner Blvd you'll be on the strip as the CN Tower, Ripley's Aquarium, The Metro Toronto Convention Centre, Restaurants and steps away from Harbour Front and The Toronto Ferry Terminal. 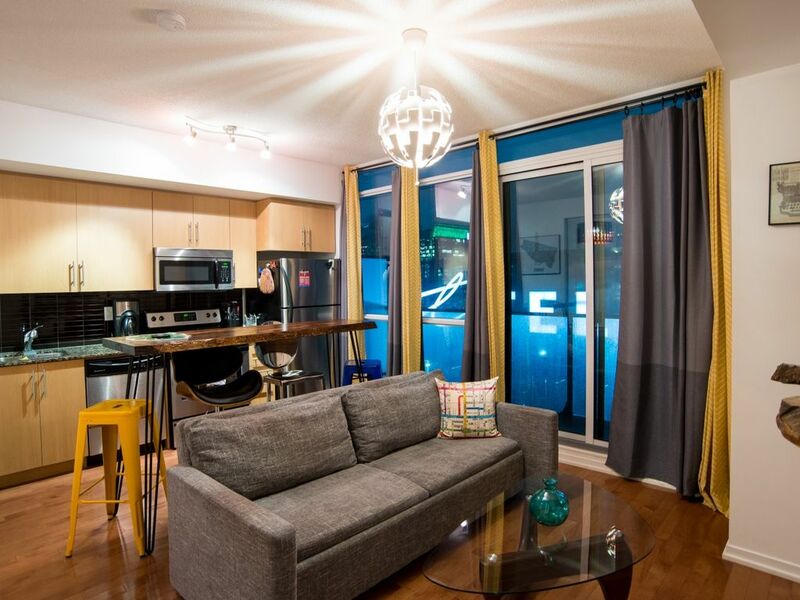 This elegant 1Bedroom unit is fully equipped/move in ready for your comfort and convince. Inside the bedroom you'll enjoy the comfort of a Queen Size Bed. The sofa also pulls out to a Queen Size bed. Fresh towels are also provided for your comfort and convenience. This apartment is in a great location close to restaurants, bars and the Scotiabank Centre as well as Roger centre. Nice condo and nicely decorated. Great location and spotless condo. This condo is amazingly located in close proximity to the Scotiabank Arena, Rogers Centre and tons of bars/restaurants. Longos with a Starbucks is located downstairs which was very convenient. The condo was spotless and had a coffee maker and some coffee. It was great value, and perfect for a one night stay for an early morning meeting. The local hotels were mostly booked and very expensive. This is a great option, and I'd gladly stay here again for any sporting event or just a weekend downtown. The only thing I didn't love was having to take 2 elevators and on check in, I had to sneak in the door to the second set of elevators because I didn't have the FOB.